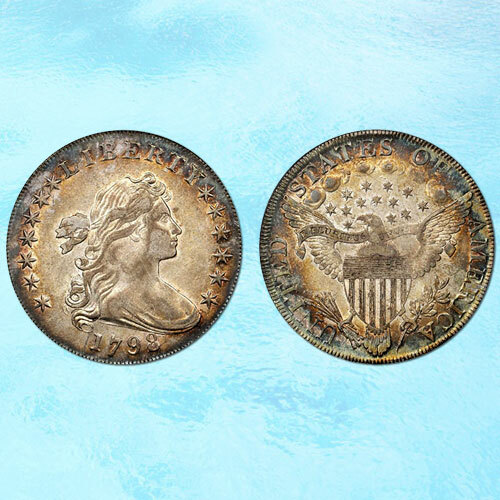 Stack’s Bowers Galleries is all geared up to host the official auctions of the Whitman Coin and Collectibles Expo, taking place on 9th November to 12th November at the Baltimore Convention Center. The 253-lot rarities Night session Nov. 9 showcases many consignments and will present offerings from the Cardinal Collection Educational Foundation, the Alexander Collection, The Murray Hill Collection — the latter consisting of just 17 coins but containing rarities like one of the finest known 1879 $4 Stella gold patterns — and several choice selections from the estate of dealer Catherine E. Bullowa. Among the selections from the Bullowa estate are many quality-driven early American dollars, including a 1798 Draped Bust, Heraldic Eagle silver dollar graded About Uncirculated 53 by Professional Coin Grading Service, with a gold Certified Acceptance Corp. sticker that indicates that the coin could at least easily upgrade to the next grade level. The Cardinal Collection brings the finest early dollar in the sale, a 1797 Draped Bust silver dollar graded Mint State 64 by PCGS that is the only Mint State survivor of the BB-72 variety. The variety is the rarest of three known die pairings of the 1797 Draped Bust dollar and has 15 obverse stars with small letters in the inscriptions on the reverse. It was most recently offered at Heritage’s November 2013 sale of Part II of the Eric P. Newman Collection where — then graded MS-64 by Numismatic Guaranty Corp. — it sold for $381,875. Newman acquired it in the mid-20th century for $125 as part of his acquisition of the E.H.R. Green estate.